If you had given up on Graff in the TAB Clarendon Stakes (1300m) at Hawkesbury, you weren’t alone. Kris Lees revealed he had all but conceded defeat when his two-year-old was already under pressure turning for home but the undefeated youngster dug deep to hold off a late charge from first starter Mickey Blue Eyes. “I had given up on him coming to the corner when he’d come off the bridle,” Lees said. The son of Star Witness will now head to Queensland with the Group One JJ Atkins over the mile his long term target. Blake Shinn, meanwhile, was at a loss to explain the disappointing effort from Orcien. Up ‘N’ Rolling was a dominant winner at Hawkesbury over 1500m and it has been noticeable that Chris Waller has kept him over shorter trips this time in. Last preparation the former Kiwi got out to 2400m. “There isn’t much of him so I don’t think he is strong enough for 2000m but around the mile is perfect because he still has enough speed to be effective over it,” said stable rep Charlie Duckworth. The Scone Cup (1600m) is now on the radar for the five-year-old who had his first four starts in New Zealand. There are no more popular winners than a favourite in the last and that was certainly the case with Roman Son at Hawkesbury. The promising stayer came into his third up assignment with a boom and he let nobody down, zipping clear to win with a bit up his sleeve. Tye Angland, who picked up the ride from Kerrin McEvoy, said the four-year-old has plenty of attitude and but the raw ability to match. "He was able to find a comfortable spot, got into his rhythm and when I asked him he took one stride to grab the bit and when I came out he let go," Angland said. "I got there way too soon and he ducked out towards the enclosure but to me that's him just doing it so easily." Trainer Richard Freedman, who conceded he was a little worried at the top of the straight, is buoyed by the amount of mental improvement still to come from Roman Son. 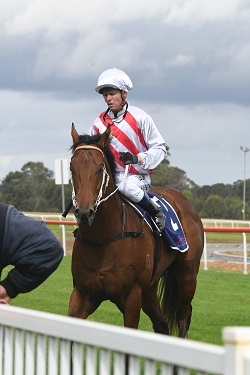 Glenall has “has got Group class ability” according to Brenton Avdulla and the colt took his first step to proving that in taking out the Listed Hawkesbury XXXX Gold Rush (1100m). Avdulla summed the race up beautifully in the early stages, taking the cart across from race favourite Tango Rain, and having paraded as a very fit horse in the yard, pulled out enough at the finish to hold off Spending To Win. Scone and Queensland are now both in the sights of the galloper trained by Team Hawkes, who also took out the Hawkesbury Gold Cup (1600m) with Kingsgaurd. Meanwhile, Passage Of Time could only manage a midfield finish but if races were won on looks, he’d have been in the winners’ stall! Write this name down – Rebel Cry. It won’t be the last time this filly will be winning. The Kris Lees-trained two-year-old donkey-licked her rivals in the opening race at Newcastle. She has speed to burn and shot clear at the finish to win by over four lengths. Making it all the more impressive is that she is bred (by Street Cry) to get out over a mile. She shouldn’t be doing what she is over 900m. Check out all the results and replays for Hawkesbury on Saturday.